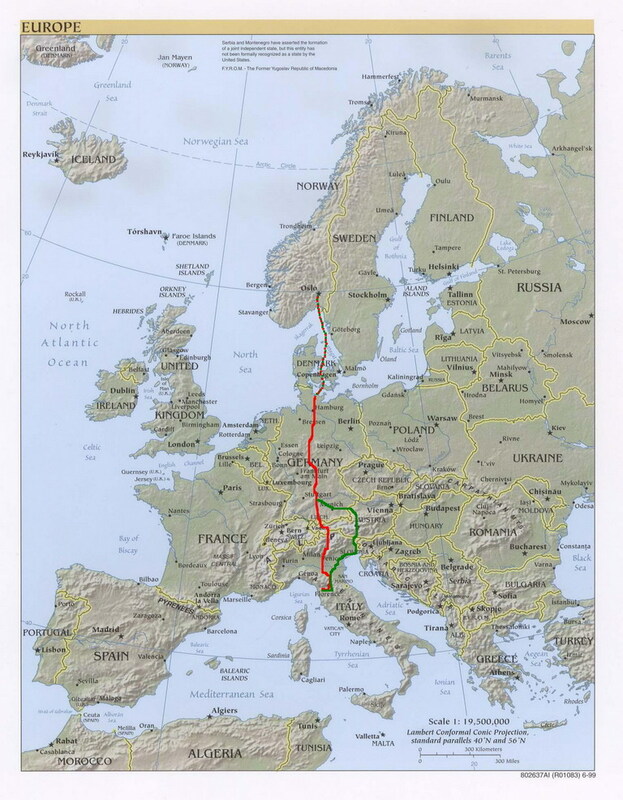 Even before the trip in 2004 was done, initial plans had been made for another follow-up journey. My brother had been to Tuscany in 1998, and had a very good impression of the place. 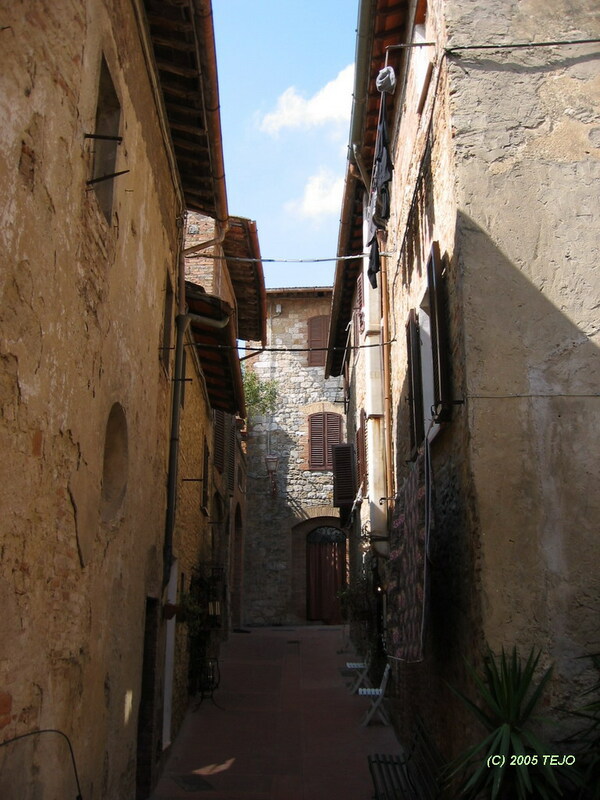 They had stayed in a very small village named Anchiano, close to the city of Lucca. This would be our starting point when searching for a place to stay and use as a base. Well, actually it is. Planning a trip is half the fun, and a trip that is well planned beforehand is much more likely to be a success than a poorly planned one. We took the opportunity to visit our biggest travel fair and see if we could find some information there. True enough, Italy had a big stand, but information about Tuscany? It was almost as if the place didn't exist. 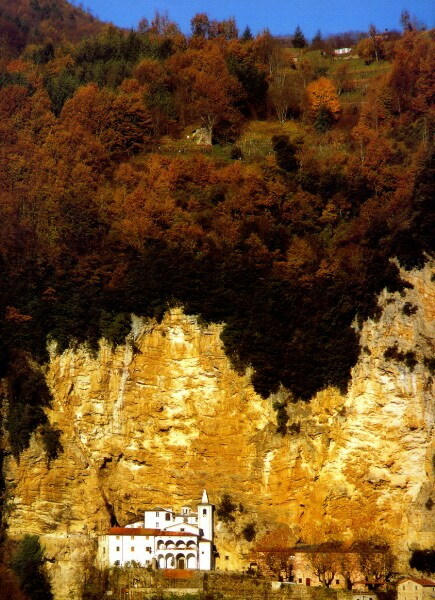 This seemed a bit strange, as it is one of the most popular regions of Italy as far as we were concerned. We managed to get a map of the area, which upon closer inspection turned out to be nothing but a map of the various local vineyards of the region. Definitely not the best one to use for sightseeing or driving! Some information seemed easier to find on the net instead - see the links section below. 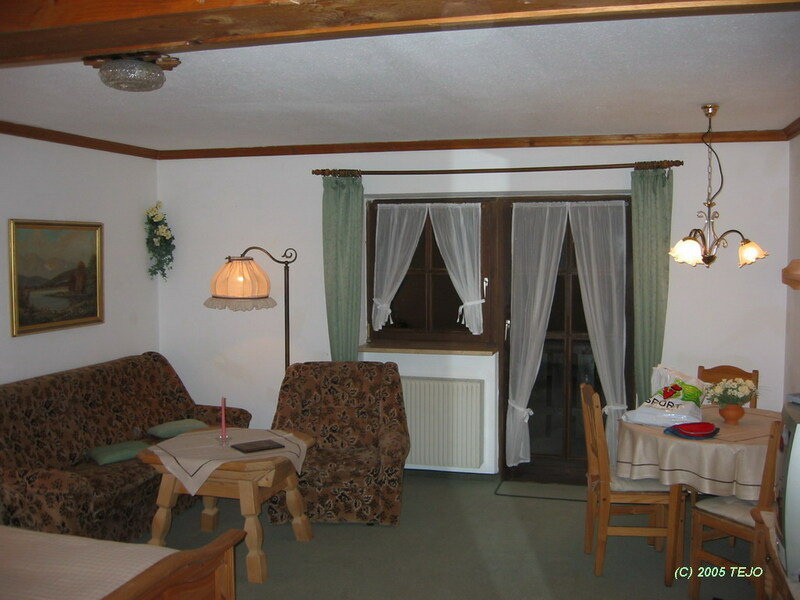 We were a bit unsure if we were going to choose a hotel as a base or rent an apartment. With an apartment we would be more free to choose when to eat, but would have to spend more time on shopping groceries and preparing food. 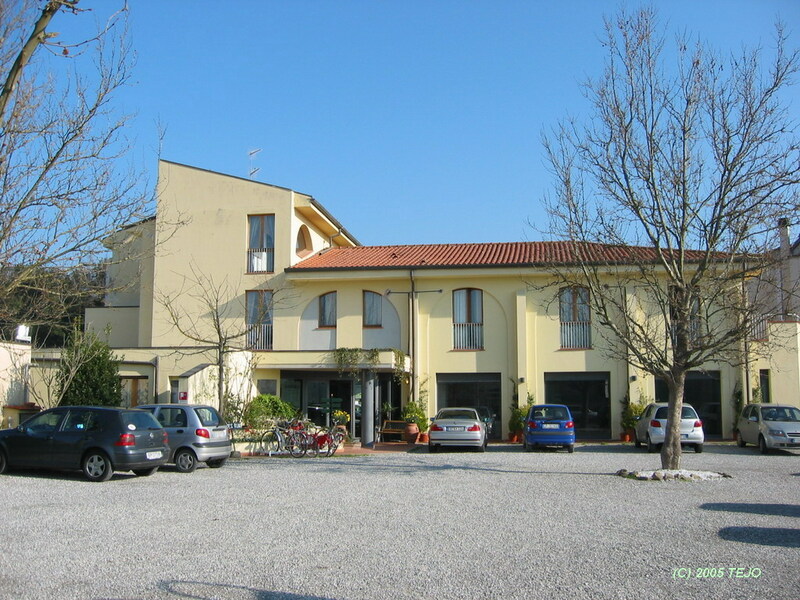 We finally decided to go for the alternative - a hotel outside the city of Lucca - namely Hotel Carignano. More about the hotel later. 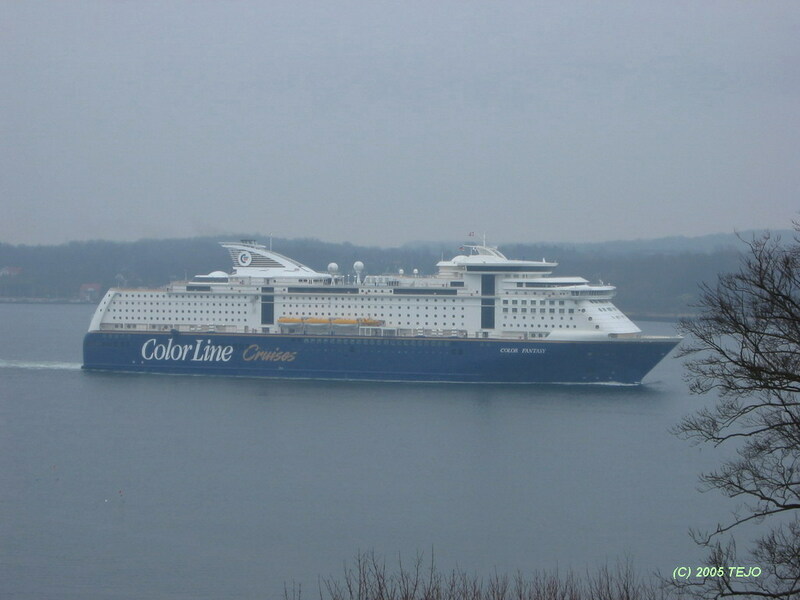 Yet another trip with Color Line to Kiel, and 20 hours later - wilkommen nach Deutschland! The car ride for the day was quite ambitious, as we planned to get to Tuscany in just two days' drive. 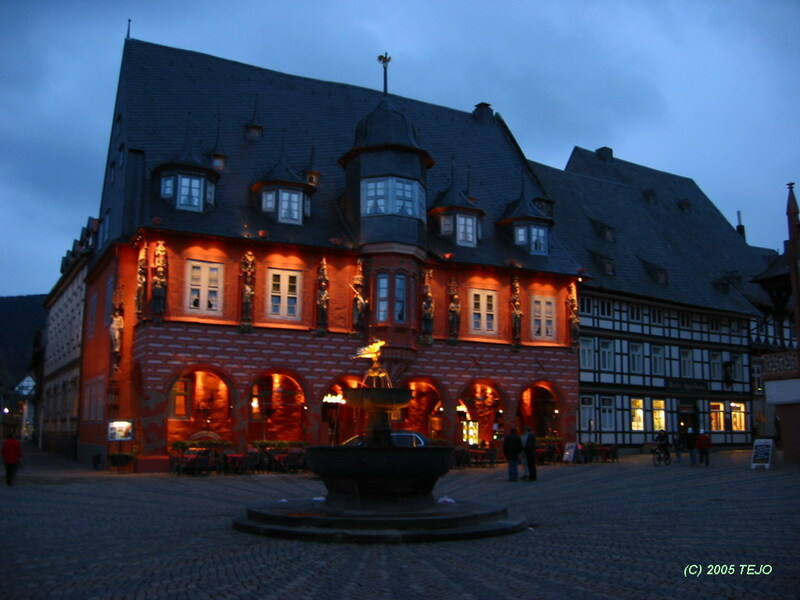 Our planned destionation was the 'klein Paradis' we had discovered the year before - Hopfen am See, and Hotel Hartung. Why change a winning formula anyway? We were about to find out that our chosen time of plowing through Germany was not the best - as we neared Würzburg and the crossing of major autobahns (in German 'Autobahnkreutz') that led to several major cities (Stuttgart, Nürnberg in addition to München), boom - wilkommen als der Stau! It would seem as if every citizen in the major cities had been on vacation and homeward bound. After a total driving time of 10 hours, including a lunch break as well as a separate break for yellow-eyed travellers, we reached our destination - 870 km from Kiel, giving us an average speed of 87 km/h including the major jam as well as the breaks - not bad at all! After checking in at Hartung (where they recognised us from the year before), we headed over to our local favourite (Italian) restaurant - Riviera, part of the hotel Alpenblick. The other place we had gotten to know as a fine dining restaurant was the Chinese one named Winlong (more than likely spelled Vinlong in Chinese, but Germans tend to forget or not know that a foreign V isn't pronounced F). The waiter at our times of visiting was probably also the owner of the place, a quite animated fellow with a great sense of hospitality, as he on one occasion served a free plum wine (2004 actually), and on another a glass of white wine. The afternoon was set aside for a walk around the Hopfensee, literally less than a stone's throw from our hotel. The Uferpromenade covers the entire stretch of the village, and changes into a gravel path outside, going around the lake and passing through a small nature reserve where frogs and birds are dominant. It is a pleasant stroll of around 1.5 - 2 hours. There were still some icy conditions on the 28th of March - not too surprising, as winter is often late at this latitude and height (around 800 metres above sea level). Bienvenuto á Italia and some expensive driving! It was good to have a day off in between the driving days, as our next stage was more than 600 km. The same route from Füssen over Reutte im Tirol, then Innsbruck and the Brenner pass was chosen, as it is the fastest road and the lowest border crossing between Italy and Austria at around 1300 m, and the long valley which ends in Bolzano is very scenic, although the joints between bridge parts and elevated autostrada elements tend to be a bit numerous. To the west past Bolzano is lake Garda (Lago di Garda), known as a very scenic area, but this was not part of our itinerary. 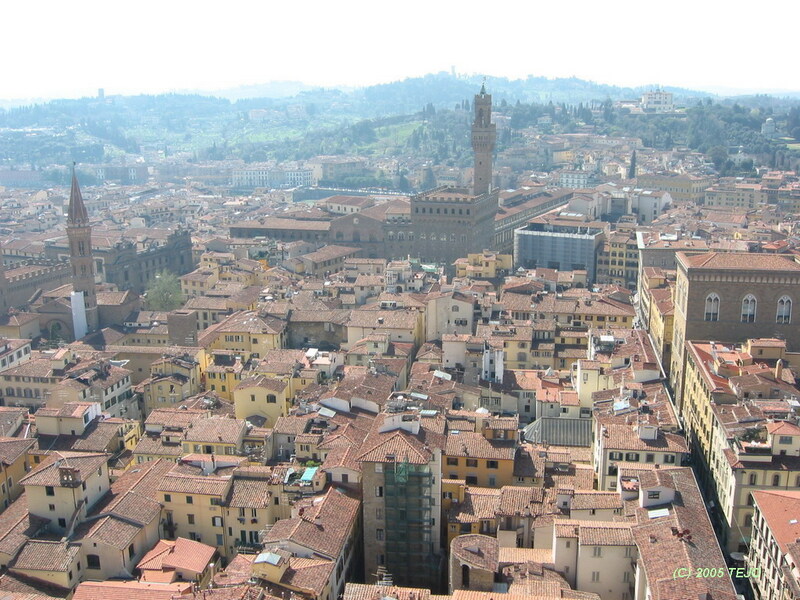 The area further south until Bologna is a vast flat land known as the Po-Venetian plain. Between Bologna and Firenze (Florence) the autostrada crosses the Apeninne mountain range, which is not very impressive when comparing with the Dolomites further north. From Firenze it was a 60 km drive to Lucca, past the largest bath 'town' in Europe, Montecatini Terme. This town houses 20.000 inhabitants, but is able to receive almost 2 million visitors to their numerous spa services. Finally arriving at Lucca, just after having passed an impressive viaduct ruin, it was time to leave the autostrada and be rewarded with a light shock. Not only did the strict female voice at the automated pay booth demand 27 euros for that single drive from the border, but she was also obviously in a hurry as she repeated the cost of the ride a few seconds later while we were trying to dig up the amount demanded. After swallowing our hard earned (exchanged?) cash, she ushered us on with a quick and militant 'arrivederci'. It was good to finally leave the heavy, stressful and somewhat undisciplined traffic of the autostrada, but the traffic when entering Lucca, a city with around 100.000 inhabitants itself, wasn't much of a relief. Thankfully, it seemed that traffic culture, especially the use of the horn, had improved since my brother's last visit, according to him. Still, it took us a while to figure out how to reach our hotel, named Carignano, but when we finally did, we saw we had made a wise choice, as this was far enough away from the city to be in a quiet area, yet centrally located. From the beginning of the year, Italy had enforced a new law which banned smoking from public areas, hotels and restaurants, a welcome thing indeed. Breakfast was ok enough but nothing special and somewhat limited - in Italy this would still be called a buffet, as we noticed the natives barely having time to gulp down an Espresso and possibly having time for a glass of orange juice at best, before leaving in a hurry. 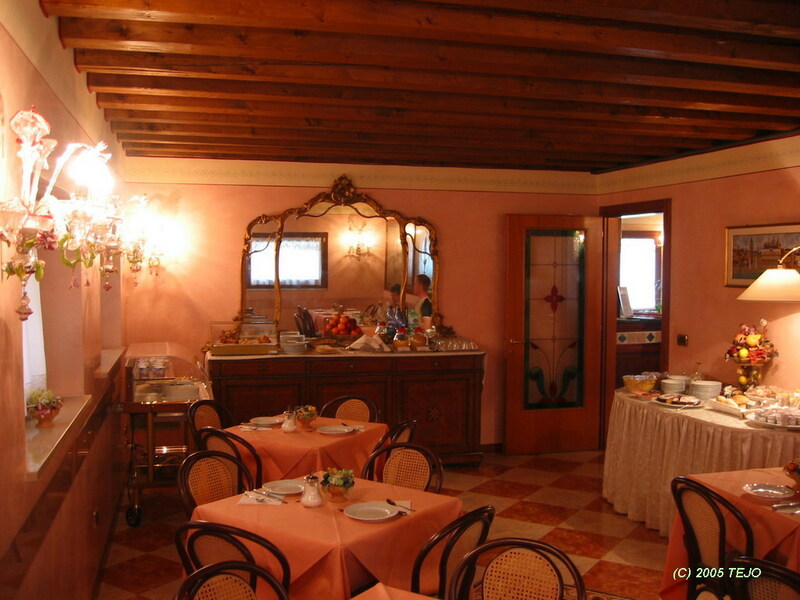 The Hotel Carignano also housed a restaurant, known as 'Cantina di Carignano'. A convenient place for our first dinner, it was a good experience, except for a bit of overcharging (we ordered various pizzas, and the amount on the bill was higher than stated on the menu - not including cover charge), but we decided not to fuss over it. 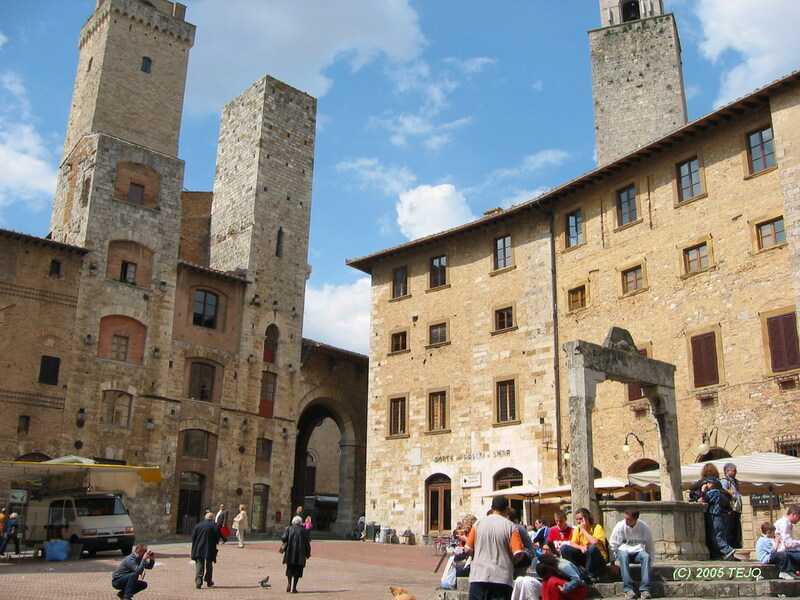 We started with a scenic drive to the old fortified town of San Gimignano. Perfectly placed on top of a small hill, this small town is very well preserved and gives a fabulous 'typical-Italian-medieval-fortified-town' feeling, as the whole area is a pedestrian zone and no tourists seem to be in a hurry - indeed, even the native Italians seemed to not rush things. Founded in the 3rd century BC by Etruscans, it is best known for its many towers which date back to the 11th and 12th century. These were built as rivalling families competed for prestige and influence, and the town is among few who have managed to preserve a few of them. Strolling through the narrow cobblestone streets, you will see a very charming side of Italy, laundry hanging down walls and views of the surrounding landscape which is very 'classic Tuscany' - gently rolling hills with olive and cypress trees. 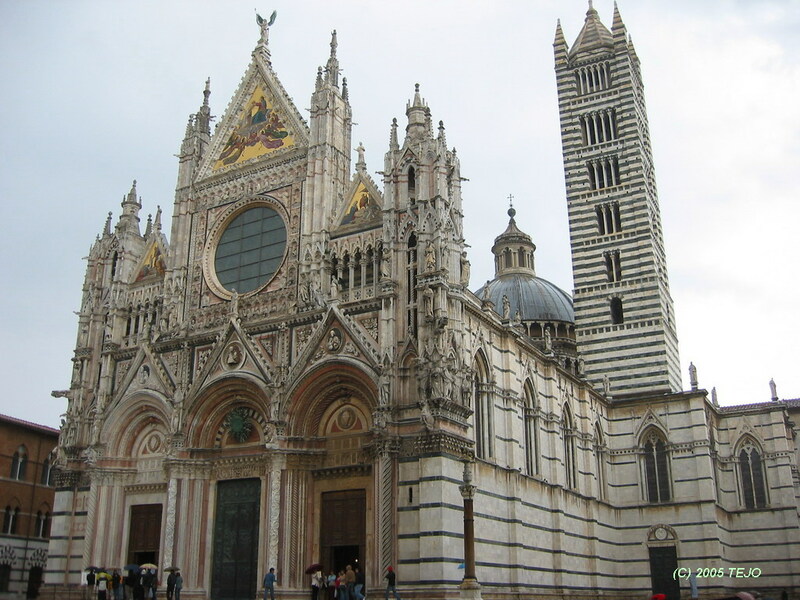 After a relatively short drive past another fortified town, Montepulciano, we reached Siena. by the 102-metre tower which is part of the Palazzo Publicco (Town Hall). Nine marked 'areas' spread out in a fan-shaped form on the piazza from the town hall, symbolic of the governers of Siena in the early 14th century, the Noveschi or Committee of Nine. The Piazza is perhaps most known for its semi-annual horse race known as the 'Palio di Siena', which is somewhat controversial due to the hard stone arena and packed crowds. We also chose to drop by the Duomo (cathedral), which was a very impressive sight. However, original plans made for it to be even more impressive, as today's axis is actually the 'short side', which was built first, with the intention of adding a much larger aisle. Had they not run out of funds, this cathedral would have been the largest in existence (at least at the time of its construction - the 14th century). We were very unlucky with the weather - on the Piazza, we had a serious downpour, and constant rain on the way back to the car. In addition, my new and previously unused umbrella broke - all this deteriorated the experience somewhat. The next day was set aside to a break from towns and cities for a more scenic tour. 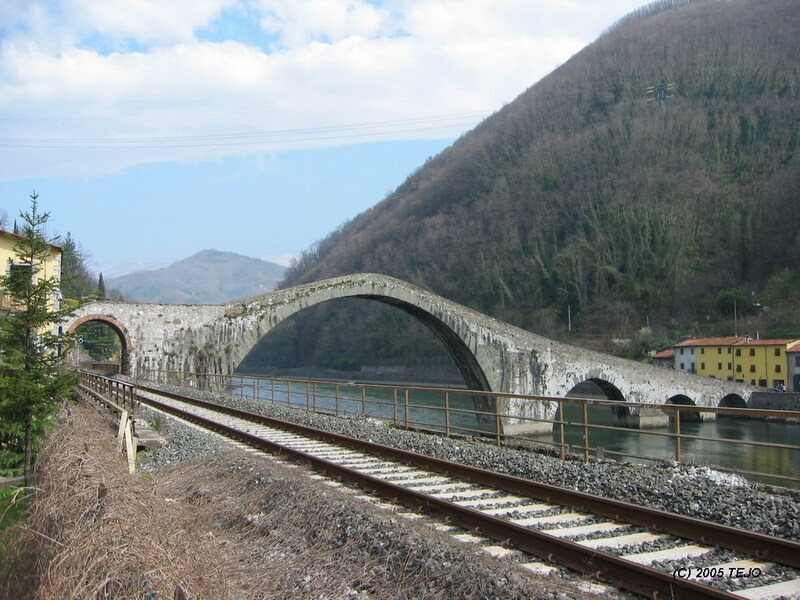 We headed north from Lucca into the Val di Serchio, also known as the Garfagnana area, choosing to stop at four locations. There is an alternative version of the legend, where it ends with the builder sending his dog across instead. air inside the cave is a constant 10.7°C, in summer the air inside is heavier than the one outside, creating an outgoing wind at the lower entrance, while in winter, the air will come out of the top opening. Guided tours will pass by an armoured door which blocks the air current, but it is very noticeable when the door is open. The first real expedition happened in 1932 but was cut short by a submerged gallery. Today, more than 4 km of tunnels have been explored, and at least 30 unexplored branches remain. There are five guided tours or itineraries, where we chose the shortest one at 1 hour. The remaining ones are separate or combined versions of the others, the longest being 3 hours, possibly best suited for avid cave fans. On the tour we had, we passed some breathtaking scenery. The water is crystal clear and mirrors the cave roof perfectly as in a dream. The largest hall is 20 metres high, and there is also a chimney on the route which is 40 metres high. Colours are very varying: mostly, yellow coloured stone is rich in calcium, grey contains manganese, while red reveals a lot of iron. 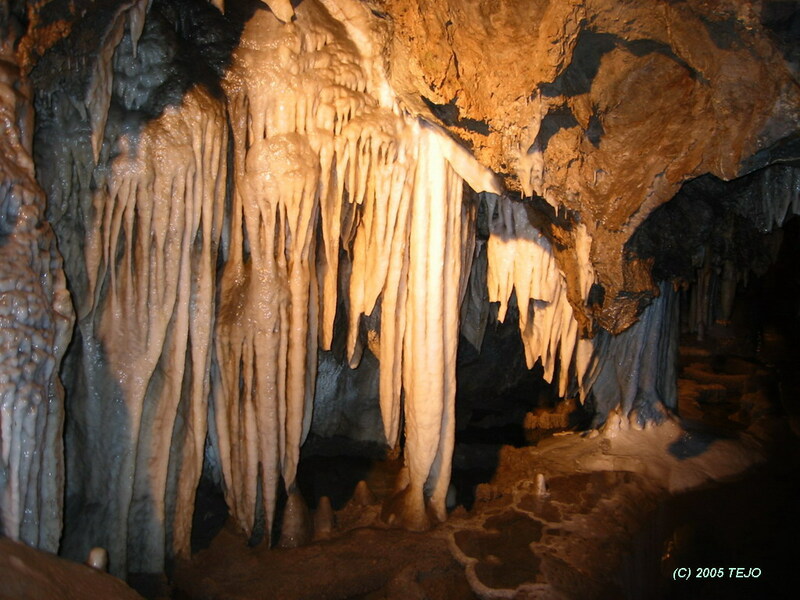 There are endless amounts of stalactites and stalagmites, creating some beautiful formations. Yet they are also very fragile and break easily - do not touch! It takes 100 years for one of these to grow 1 centimetre. After the cave visit, it was time to search for a place to eat - easier said than done. The area where the cave is had its own restaurant, but was not yet opened for the season. On the way back, we passed and stopped by a small house which I refer to as the 'Inca café' (possibly due to the commercial sign of the coffe brand) which was unpleasant enough to send us further on our way. We decided to look for a place to eat on the way to our final destination - Lago di Vagli. This is a man-made lake, and the dam is sometimes emptied, revealing the remains of a town somewhere below the surface. It turned out they drain this lake every 10 years or so, and even this early in the year, we drove and walked, searching desperately for a single sign of the town sticking up above the surface of the water. We dropped by the small community of Vagli di Sotto perched above the lake, as well as searched for a place to eat in the vicinity - no luck at all, as everything was closed. It was time to relax a little, and we chose to take half a day off sightseeing and instead get some laundry done. After asking at our hotel and a bit of searching, we found a place aptly named Niagara. We also decided to visit the local supermarket in order to have a backup lunch ready. We then took a short afternoon drive to Pisa along a cosy countryside road which was pleasantly lightly trafficked. No map was needed to find our way to our only interesting destination, as the leaning tower was visible several kilometres away. We managed to park the car pretty close and proceeded to walk past several stalls of cheap fake brand copies of various uninteresting things. This was clearly a very touristic area, although sweaters and postcards were also obtainable (somewhat more interesting than Rolexes). Not surprising, really, as the major sight of the town is of course the leaning tower. 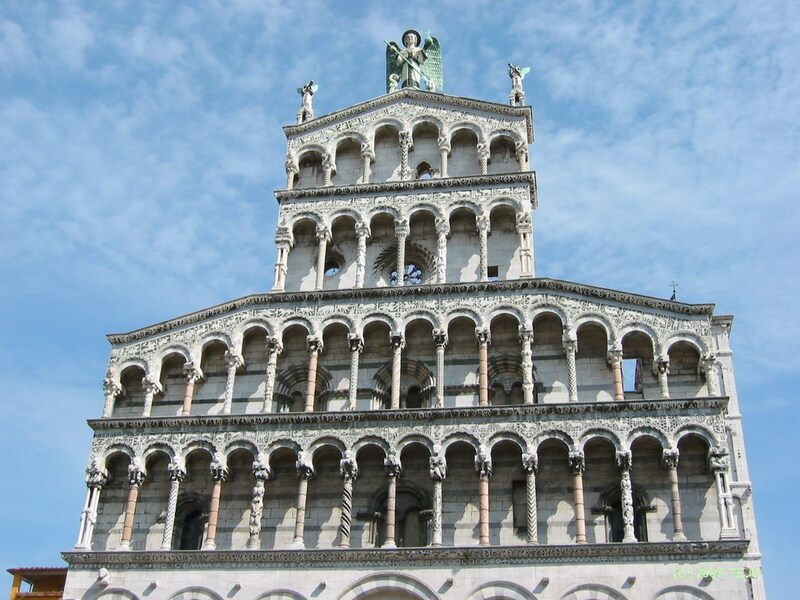 Situated on a field named Campo dei Miracoli (Field of Miracles), it attracts truckloads of visitors, and after having been through a major restoration in order to keep it from toppling over, it was again possible to ascend. Tickets are bought at a separate stall, and your ticket will be valid for a certain time of day, so until our time had come, we decided to relax on the pleasant green lawn in front of the tower. In the late afternoon, the sun was warming well enough to give an excellent feeling of Spring time, and the temperature must have been close to 20°C. 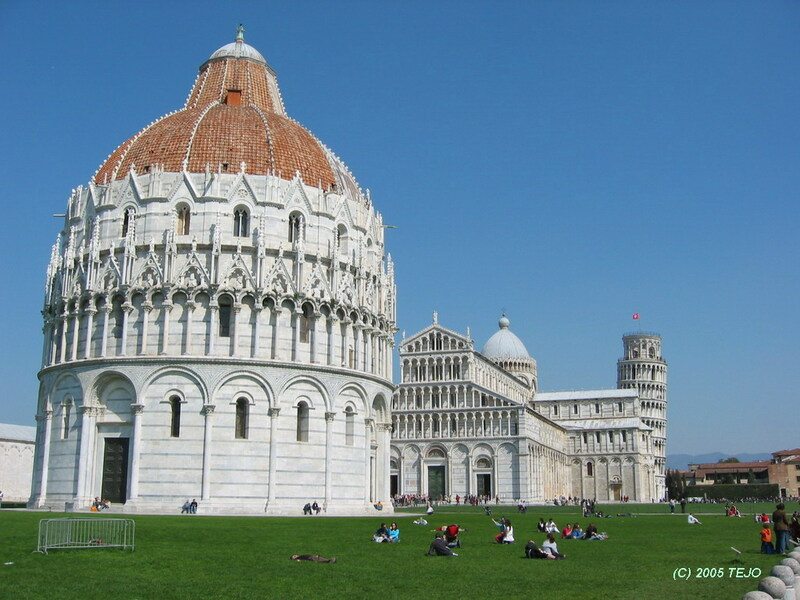 The tower, along with the Duomo and Battistero (Baptistry) were built back when Pisa was a major and wealthy city as symbols of their power. 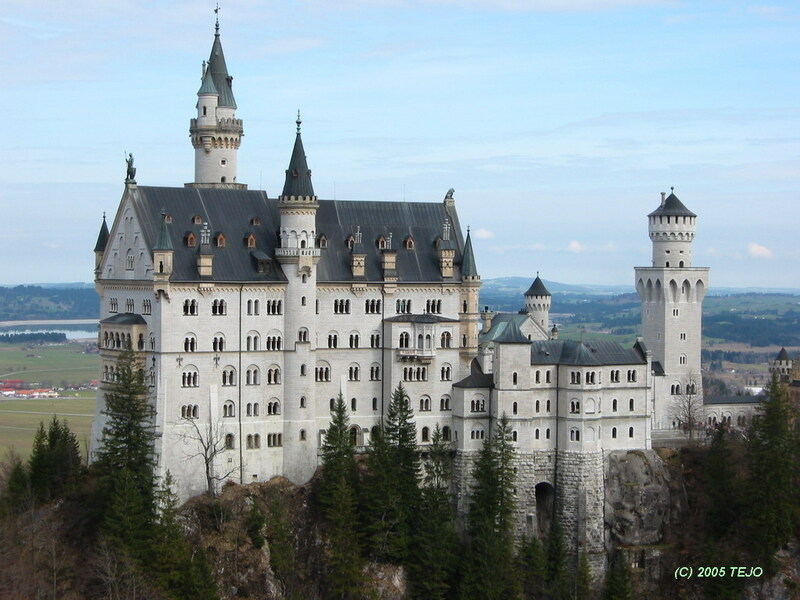 The tower was constructed over a period of 174 years, beginning in 1173. 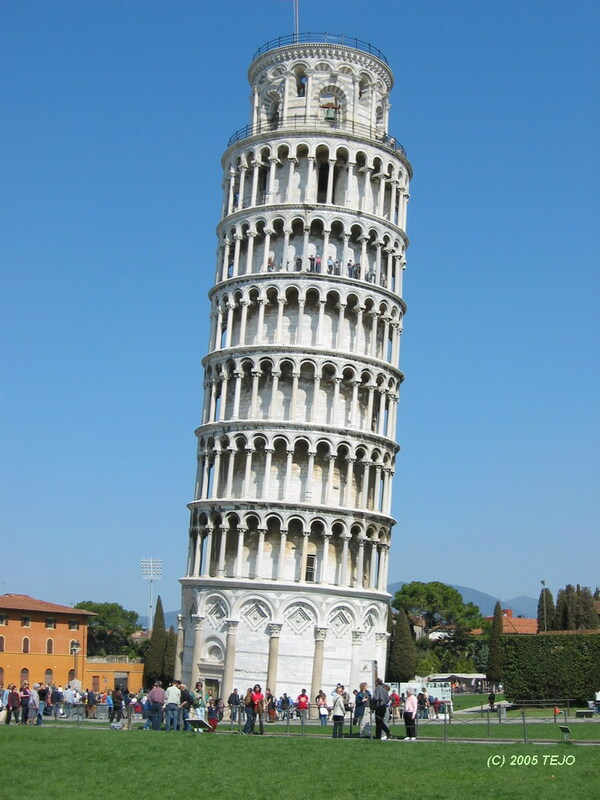 The source of the leaning comes from a design flaw in the beginning. The tower was built on weak, unstable subsoil, and already as the third floor was built, the tower started to lean. 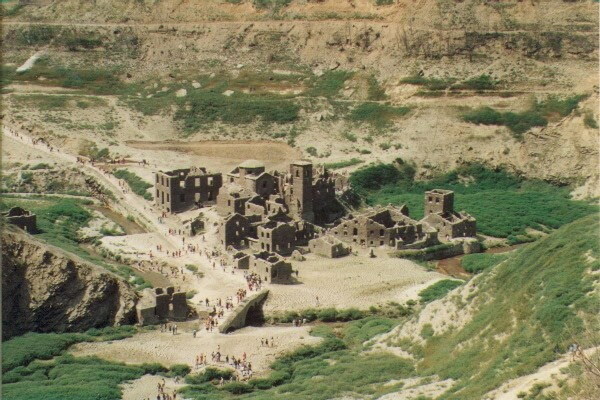 At this point, construction was halted for almost a century due to battles with other powerful cities. The soil settled, and another four floors were built at an angle to compensate for the tilt. The bell chamber was finally added in 1372. The tower continued to lean however, reaching an angle of 5.5 degrees, making the top 4.5 metres away from the vertical. In 1964, a multinational assembly was gathered to solve the toppling problem. After more than two decades, a solution came. The tower was closed in 1990 and finally reopened in late 2001. Many possible solutions had been considered, the final and chosen one being to remove 38 cubic metres of soil from the raised end in order to straighten it slightly - predicted to last for 300 years. The view from the 55 metre tall bell tower is great - most of Pisa is visible, including a football field as well as the marina and Mediterranean Ocean on a clear day. 294 steps lead to the top, but beware - some are very slippery due to the constant stream of visitors. Dinner was spent in a pleasant Chinese restaurant, which was sadly not off-limits from visiting hawkers - an African individual approached us at our table and offered us 'real Rolexes' at half price - no further comment necessary. On the evening news (only Italian channels were available at our hotel) we managed to gather that the Pope had died this day. 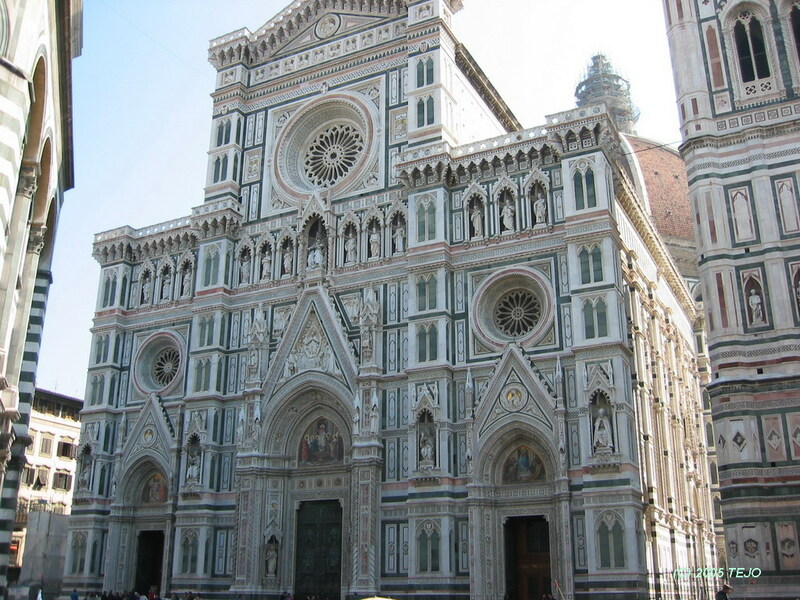 We were planning on visiting Firenze (Florence) the next day, and had hoped that this would not result in a shut-down cathedral, let alone the city itself. Still, we decided to go, as our schedule was pretty tight. It turned out our fears were for naught, as the cathedral was not only fully open and accessible, but we saw flowers being placed on the main door as well as hundreds of lit candles inside, although the city's centre population of around 400.000 (Greater Firenze houses nearly 1 million people) had not all decided to show up to pay their respects. The city was somewhat challenging when it came to navigating to a central parking lot, but we did eventually find one. 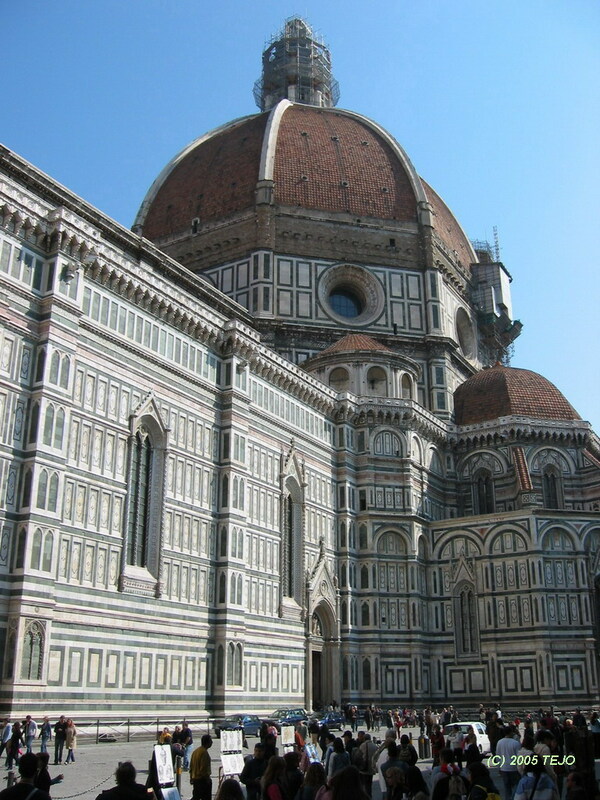 From here, it was a short walk to the first major sight - the Duomo or Cathedral (full name: Basilica di Santa Maria del Fiore), a massive structure and the 5th largest of its kind in Europe. Starting in 1296, the project took 170 years, yet the impressive facade was changed in later years and received its final look in 1887. Rising above the interior, which rooms 30.000 people, the dome is an impressive feat of engineering and the largest masonry in the world. It was built between 1420 - 1436 without the use of a wooden supporting frame, contains over 4 million bricks and weighs over 37.000 tonnes. The master engineer was Filippo Bruneschelli, and the enormous fresco work on the inside is a representation of The Last Judgement, and covers an area of 3.600 square metres. 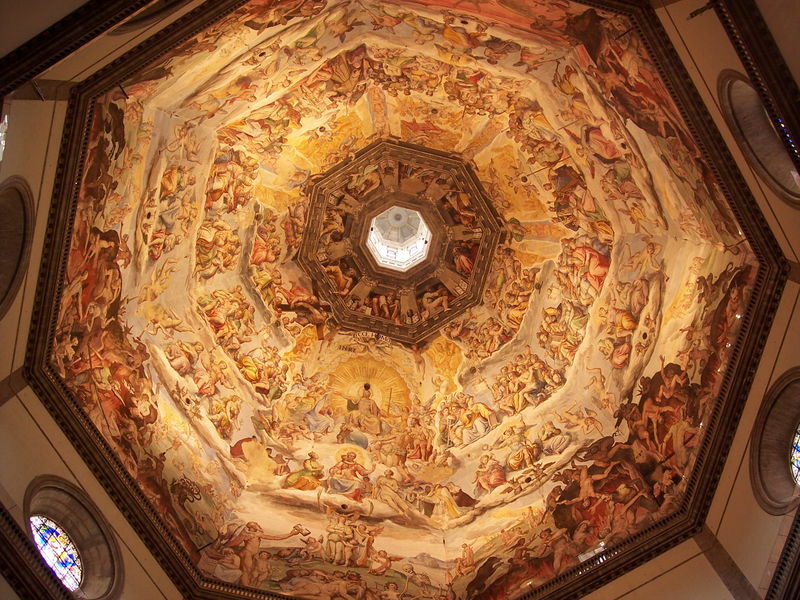 The top of the dome is 115 metres above the Piazza. Giotto's Campanile (bell tower) is a showpiece in itself. Standing 85 metres tall, it is accessible for a fee and presents a wonderful view over the city's red roofs as well as the massive cathedral itself. We decided to climb up for a look, and after 414 steps, the reward was well worth the effort. We found out how cartoon characters might feel at times however, as the bells decided to chime a couple of times on our way up. Sadly, we lacked the immortality of chartoon characters but finally got to the top, heads ringing and spinning. The old Batistero di San Giovanni (Baptistry) right next to the cathedral is believed to be the city's oldest building. 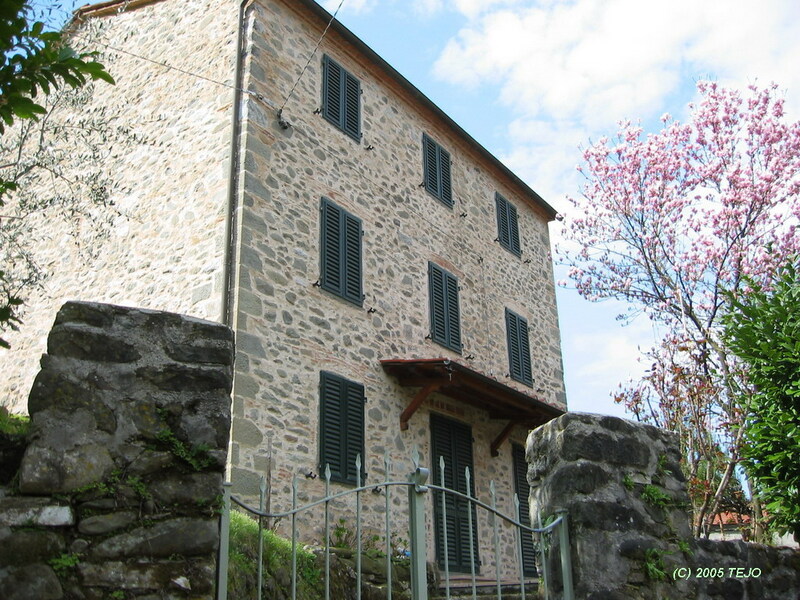 It was originally built in the 4th century, but rebuilt in 1059. 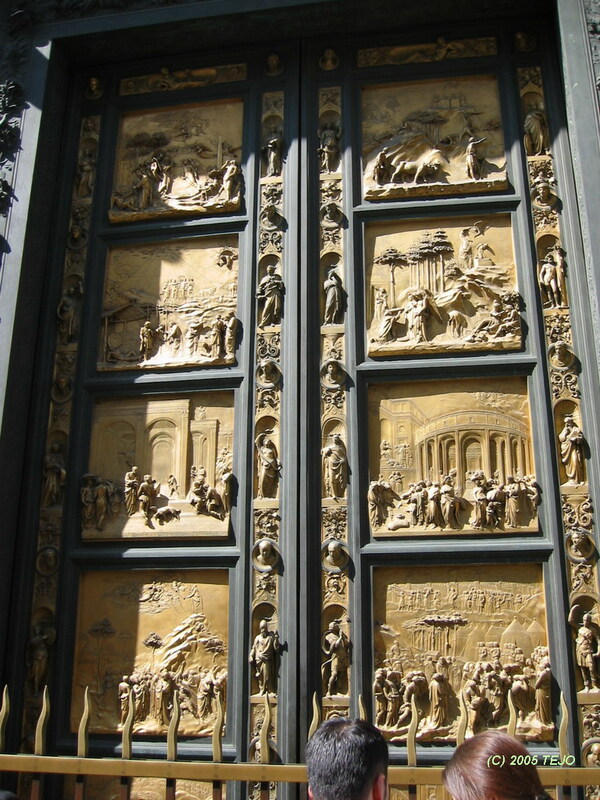 Most notable are the impressive bronze double doors (The Gates of Paradise), with 10 different relief scenes from the Bible. These doors are replicas of the originals, which have been preserved indoor since 1990 due to deterioration. Two other sets of doors show various other scenes. It was time for lunch, and in this part of Italy, nothing was closed. We enjoyed a nice salad at an Italian restaurant, and got a treat on the house: Limoncello, a pretty strong (30%-ish) liqueur. "Digestive", they said as they served us, but the taste was excellent. Where can we get some...? Next stop: Galleria dell'Accademia. For connoiseurs, no further explanation would be necessary: this is the house of Michelangelo's most famous piece of work: David. The original has been here since 1873, as the outdoor climate was deemed unhealthy. In just 4 years, on a commission from the rulers of the city, Michelangelo created this masterpiece out of one single block of Carrara marble. Standing 5.2 metres tall, it portrays the Biblical King David as he is about to battle Goliath. Studying this piece of workmanship, one can only marvel at its perfection. Even though some things are out of proportion (especially the hands and head), the attention to detail is astonishing. Muscles and veins are clearly visible, and the expression on David's face is well known throughout the world, as it portrays his thoughts just before the battle. 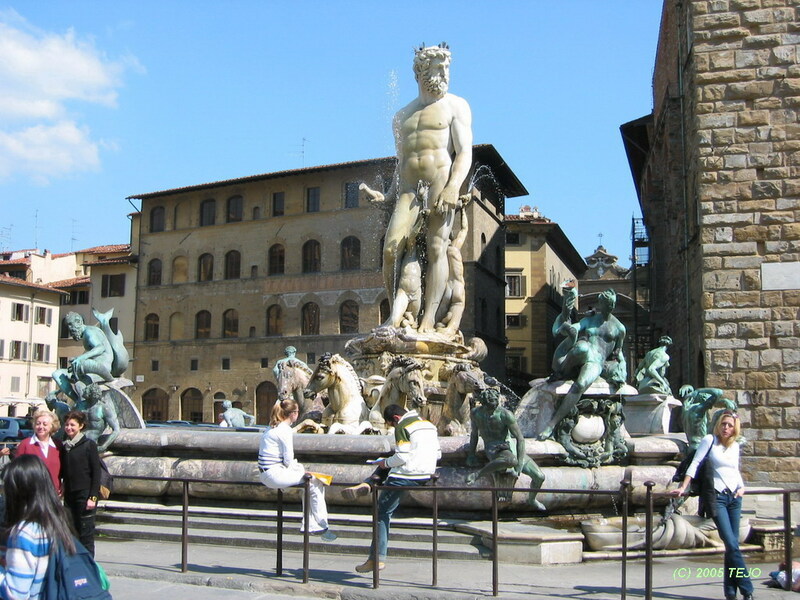 Its original location was in front of the Palazzo Vecchio, where a copy now stands. After passing this 'outdoor art museum', where several other statues are placed, we visited our last chosen sight of the day - Ponte Vecchio. In Italian, this simply means 'old bridge'. 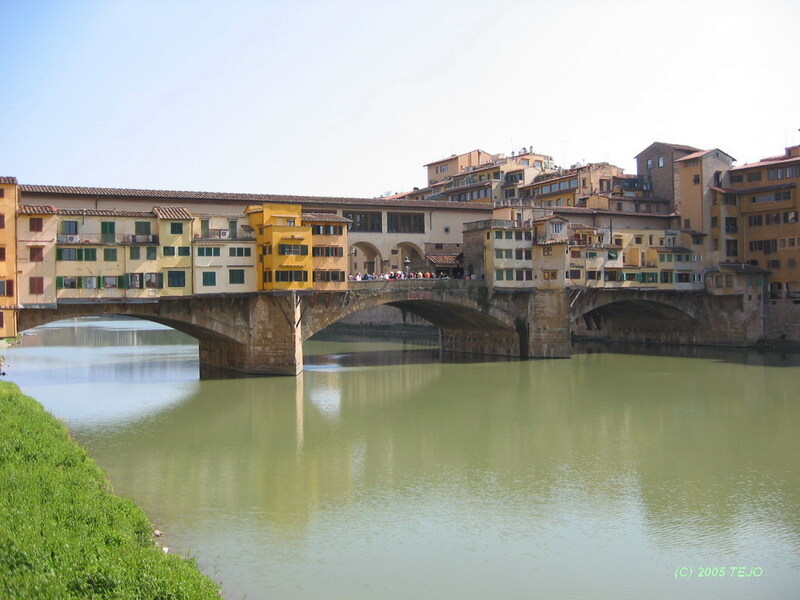 It was built in 1345 to cross the Arno river, and is most notable for all the shops built alongside, seemingly hanging in mid-air above the river. The shops were originally those of butchers, but in an act to further the prestige of the bridge, they were banned and replaced by jewelry shops. 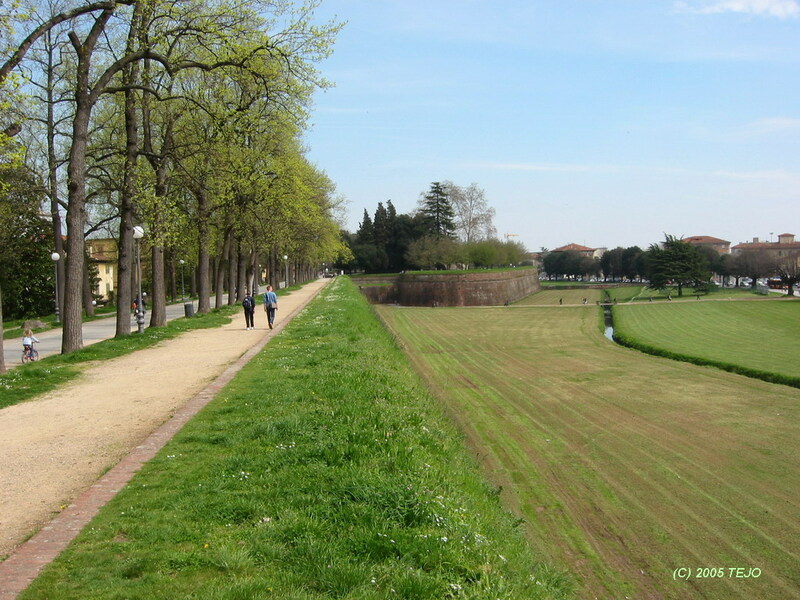 The finale of our Lucca stay was to explore the old town and its walls where we actually stayed. 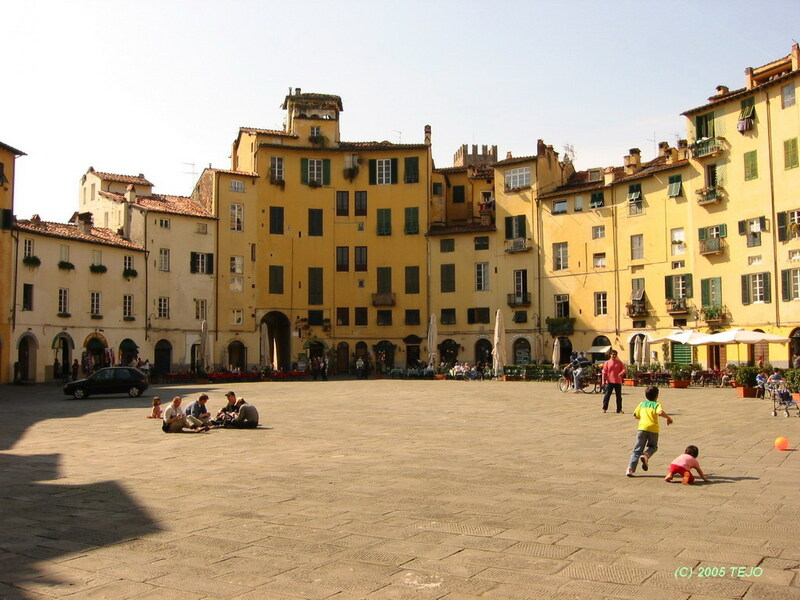 Lucca is a well-preserved medieval town with many narrow streets, and is completely encased by an intact wall, which is up to 30 metres wide. It provides for a pleasant stroll around the town, and combined with a tour along the narrow streets, makes for a none-too taxing day excursion. Major sights include the Duomo di San Martino, Chiesa di San Michele, and the Piazza Anfitheatro, which was as its name says, originally the site of an amphitheatre, which has since been demolished and turned into a square, with the houses being built in a circular pattern around the piazza. At our hotel, we asked if they knew of any Chinese restaurants in town, and they said no. We did find one however, so the question may be raised: did they say no as in 'don't know if there is any' or no as in 'there isn't any'? The latter may be equally possible, as many Italians seem not to be very preoccupied with the world outside their country. The return trip was partly the same, until we drove northeastwards from Bologna towards Padova and Venezia (Venice), a total distance of around 300 km. 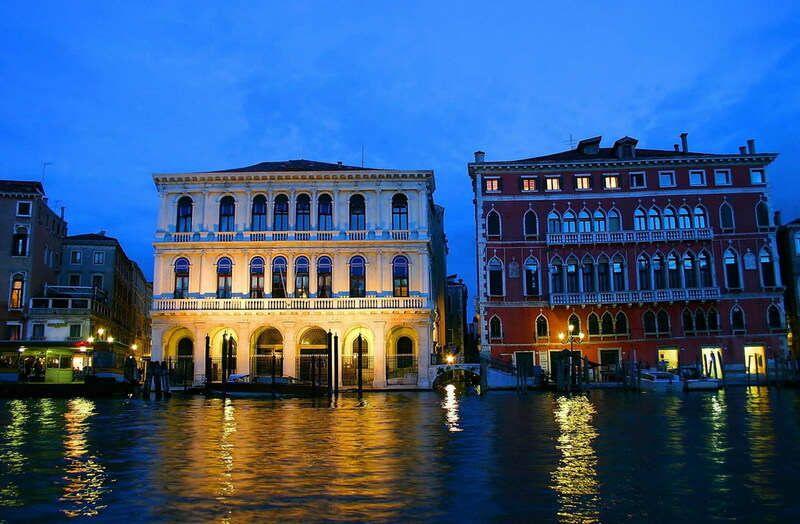 Two nights at hotel Antico Moro should be enough for seeing the old city itself - the hotel was good and decorated in Venetian style (dark wooden beams in the ceiling and some finely wrought mirror frames etc). The room was large but faced the main road and therefore not very quiet. The male owner seemed more interested in keeping his suit free of any possible microscopic grain of dust, and would also keep a close eye on us (in between watching the ongoing football game) as we exited through the back door into the 'yard' which according to the hotel leaflet featured a garden, but which was in fact a parking lot with a tiny lawn made inaccessible by a fence. The girls at the hotel were very hospitable and helpful though, and everything in the room was done perfectly in between days (such as making the bed and even neatly folding the night attire/pyjamas). Taking the bus to the old city was very cheap - just 1 euro each way. Getting there took an hour though, as the bus wound its way through every bit and piece of the newer city centre (Mestre), and also had to stop at a railroad crossing, so we arrived at the bus station (Piazzale Roma) well behind schedule. We had beforehand decided to take the so-called slow vaporetto to Piazza San Marco (St Mark's Square), and for 5 euro we got rewarded with a trip with extremely uncomfortable, hard plastic seats, unpleasantly high engine noise, crawling speed and umpteen stops on either side of the Canal Grande before finally arriving at our itinerary starting point - again behind schedule. The piazza itself is quite an experience, with impressive buildings lining all sides. 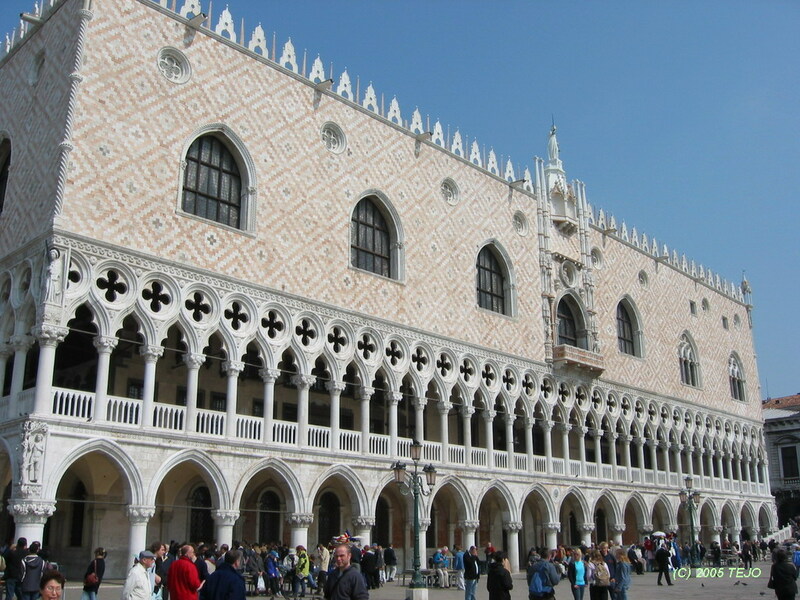 There is the Doge's Palace (the Doges ran the city in its heydays, as it was one of the most powerful in the world). 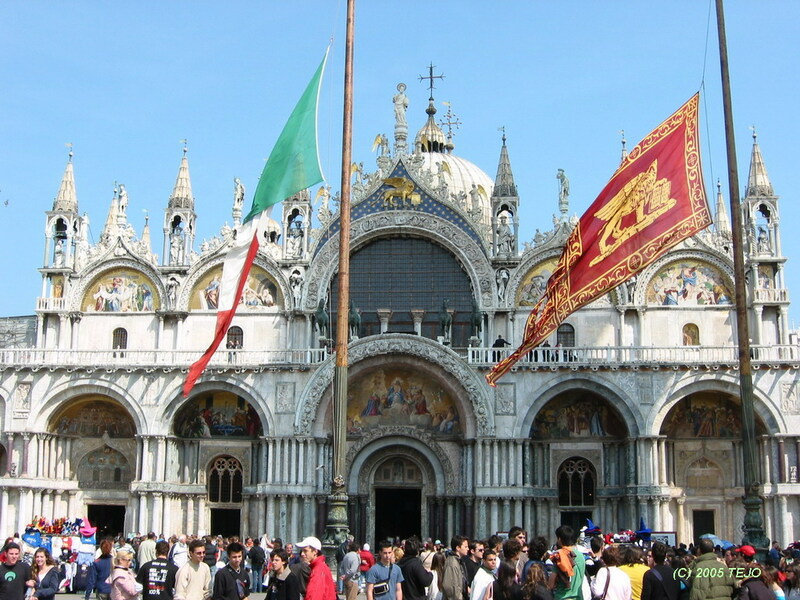 There is the Basilica di San Marco with its numerous cupolas in oriental build style. There is the Campanile di San Marco, actually a replica of the original one from 1514, which fell down in 1902. 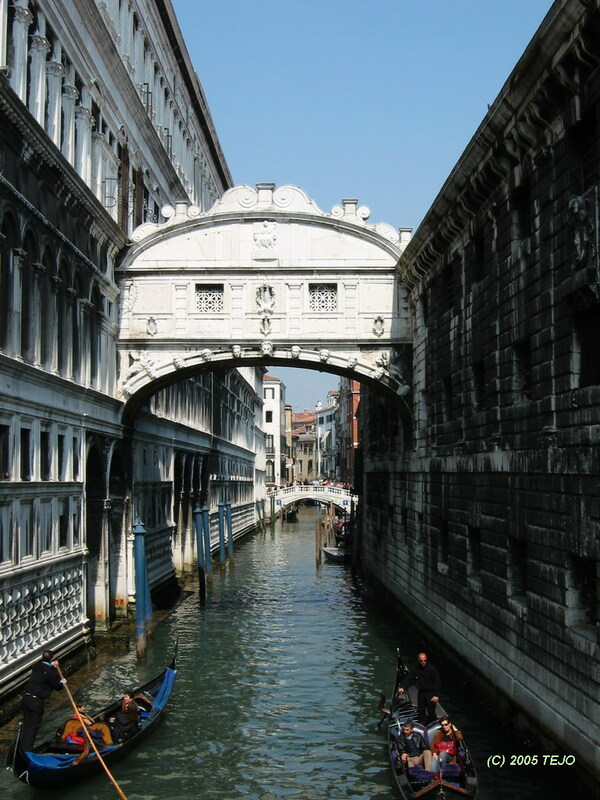 Near the piazza is the Ponte dei Sospiri (Bridge of Sighs), named so because the bridge led from the interrogation halls of the Doge's Palace to the prison cells, in between which the prisoners would sigh at their final view of the beautiful city. The name is actually from a more modern time when executions no longer took place. Our walking itinerary took us across the piazza, navigating in between the myriad of doves, back through narrow streets, walkways and small bridges via the Rialto bridge back to the bus station. Heaps of hotels, souvenir shops and restaurants are to be found all over, and every souvenir shop seems to specialise in selling carnival masks, which has traditions back to the 13th century, although it was banned in 1930 and did not resurface until the 1980s. 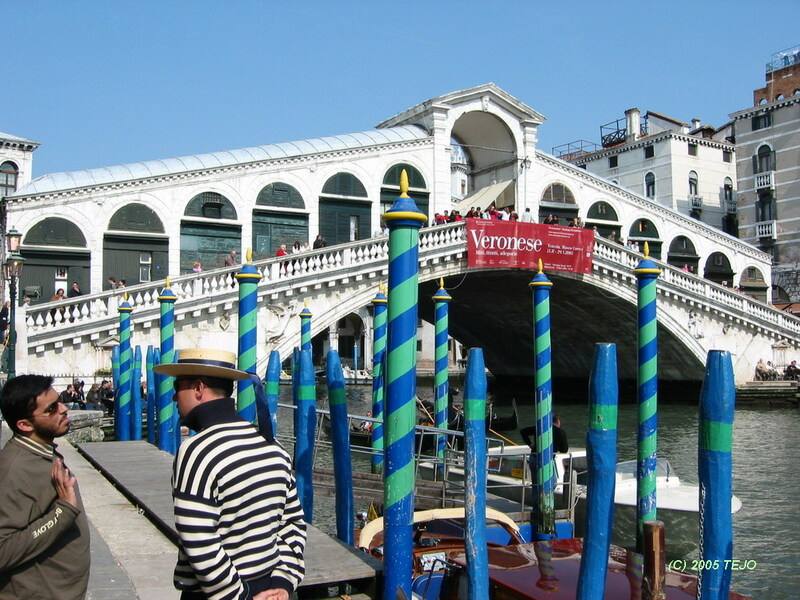 The Rialto Bridge is undoubtedly the most famous as well as the oldest bridge crossing the Canal Grande, dating back to 1591. 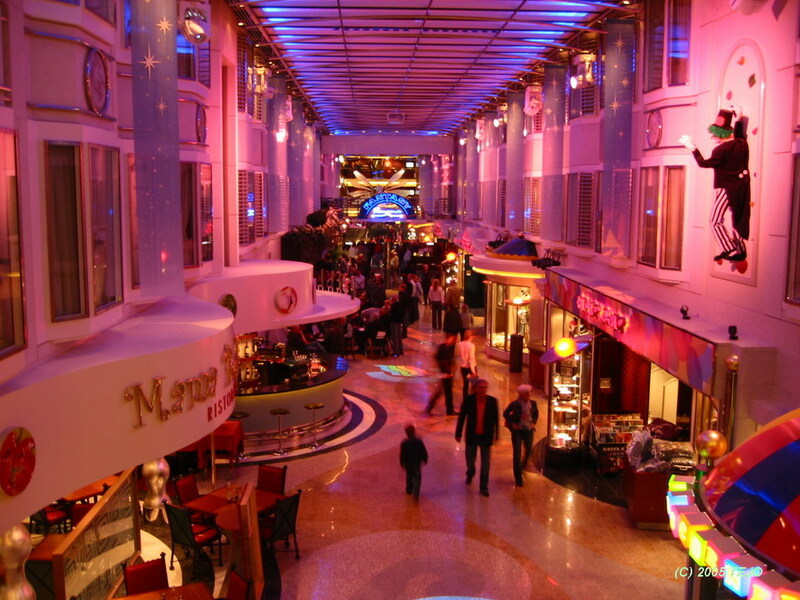 Several shops line each side of the ramps leading up to the central portico. On another bridge crossing, near a hotel dominated area, we noticed beggars on their knees singing out their horrible fate. Yet, they would look up and seem to hope if anyone had noticed them and taken pity, whereupon they would seem less troubled by their gruesome fate. It seems a bit strange that they are allowed to do their 'profession'. The walk along narrow canals and small bridges gave a lasting impression of this unique city - this is truly a different experience, and you will find no place quite like it - a visit is definitely recommended. 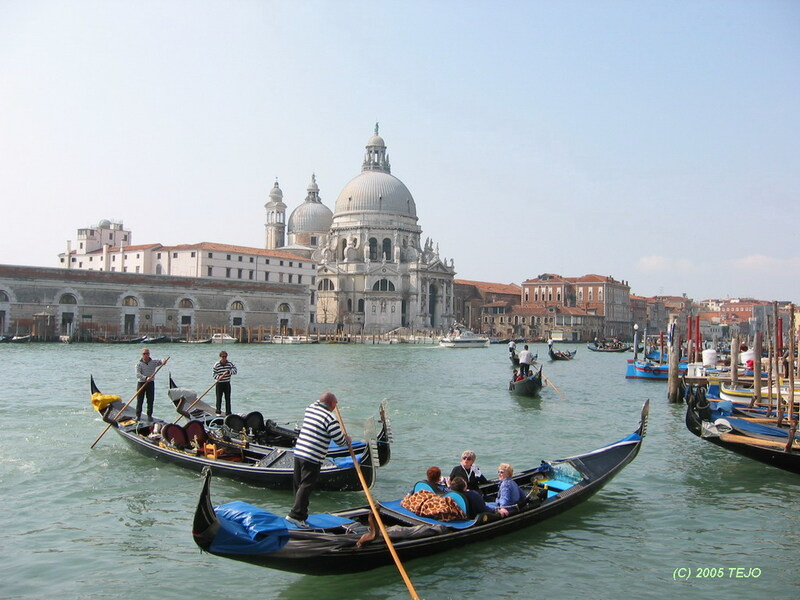 You could also go by gondola, as there are lots of inhabitants offering this service, although at ridiculous prices. On the northern part of the old city is the area originally (and still) known as the 'ghetto' - from where the word came. 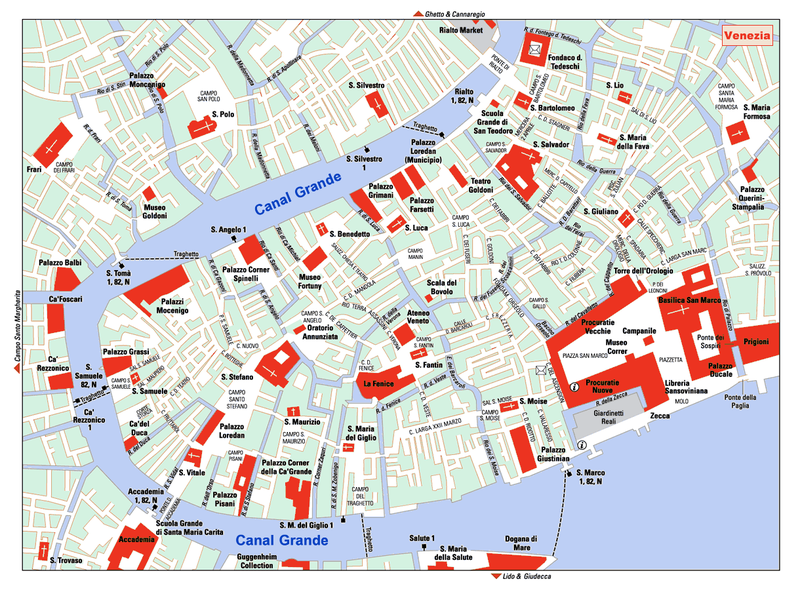 When Venezia was among the most powerful cities in the world, they instituted the Jewish population in 1516 to placate the Roman catholic church. This area was surrounded by canals, and closed off by two bridges which were opened at liberty or when they were allowed to leave their confinement. The gates were torn down by Napoleon, yet the population of the ghetto declined during the 19th century, and many houses fell into disrepair, some of which have been restored though. Zis is zee German coast guard - what are you sinking about? The buildings in Venezia are placed on closely spaced wood piles, standing on layers of clay and sand. In the 15th century, the city was protected from land based attacks by diverting all the major rivers flowing into the lagoon. This prevented sediment carried by the rivers from settling around the city, and would make the lagoon continuously deeper. During the 20th century, artesian wells (a well in which the water will flow upwards due to the opening being below its saturation or recharge level) were placed into the lagoon to draw water for local industry. At this point, Venezia began to sink. In the 1960s, these wells were banned, reducing the city's sinking rate, however it has not stopped. Low-level floods also threaten the city, in many places turning buildings' lowest floors into uninhabitable areas, forcing the population to move one floor further up where necessary. A project called MOSE (Modulo Sperimentale Elettromeccanico) is underway and to be completed in 2011, which will consist of a large number of inflatable air pontoons placed across the sea bed at the lagoon's three entrances. When high tide comes, the pontoons are supposed to inflate and block the incoming water from the Adriatic Sea. Yet, this system is expected to protect the city for only 100 years. A permanent solution is under consideration: lifting the city to a higher level by pumping water into the soil beneath. This will alter tidal patterns and damage some wildlife and is therefore source for some controversy. All in all, Venezia is definitely a place to come back to, perhaps in the evening when the atmosphere will be largely different. Were we to come back, we would skip the vaporetto ride and walk both ways instead. We followed the autostrada towards Trieste (border city with Slovenia), then went directly north towards Udine. This autostrada was a pleasure to drive compared to the others, as the traffic was far less dense and not worse than what we experienced when crossing over to Austria again. Passing along the west side of the 'Julijske Alpe' (Julian Alps) and the Slovenian border, the landscape was also very attractive. The border to Austria was crossed near Villach, and we continued towards Salzburg along the relatively newly build Tauernautobahn (extra fee charge). 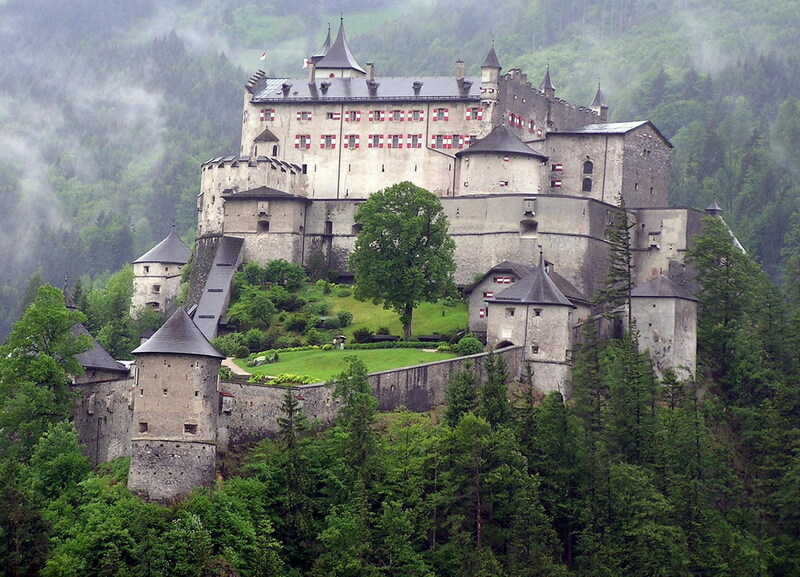 Our continued route back took us past the small town of Werfen and the Schloss Hohenwerfen (both used in the movie 'Where Eagles Dare' with the castle as the supposed Eagle's Nest in Germany). Once inside Germany, we passed the Chiemsee (although Schloss Herrenchiemsee would have to wait till another time), managed to get a bit too close to München (Munich) during rush hour, with an overnight stop in Rothenburg at the same hotel we used on our previous trip - Hotel Hornburg, then the final leg towards the A7 with an overnight stop in Goslar (as usual by now) and Kiel, where we found another place to stay - the Hotel Maritim, with an excellent location. Highly recommended! 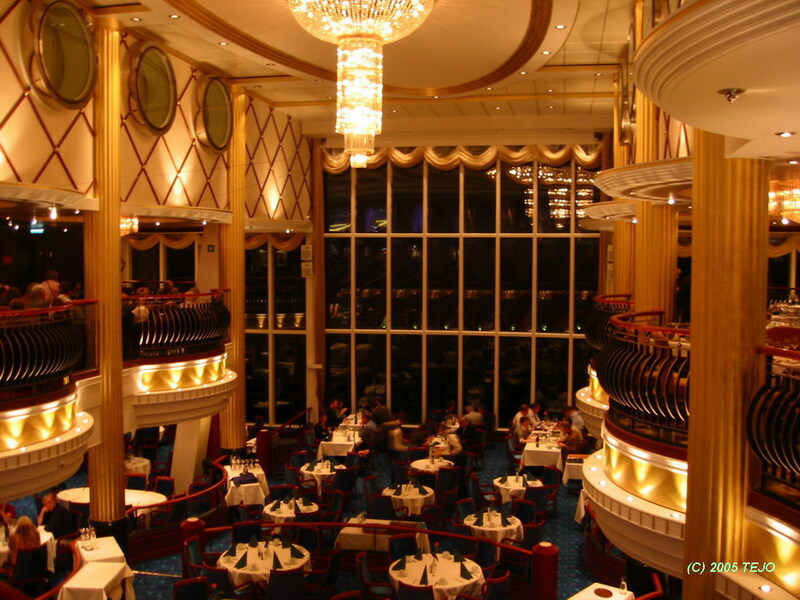 The ferry back also deserves special mention - more like a cruise ship, its interior is very impressive and is well worth a trip in itself!